Students explore standard RI.9-10.6 with this playlist. They will determine an author’s purpose. 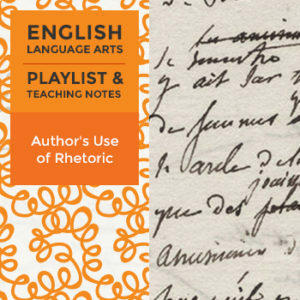 Students will identify instances of rhetoric and analyze how an author uses rhetoric to accomplish his or her purpose. Students also have the option to view instructional videos and complete practice quizzes or activities. Go to your My Purchases page (you may need to login). Beside each purchase you’ll see a Provide Feedback button that will take you to a page where you can rate and leave a brief comment. Each time you give feedback, TPT gives you feedback credits that you use to lower the cost of your future purchases. We greatly value your feedback to help us improve and create even more products. ← Congratulations to the Winners of the THREE $100 GIVEAWAYS of TpT Gift Certificates!